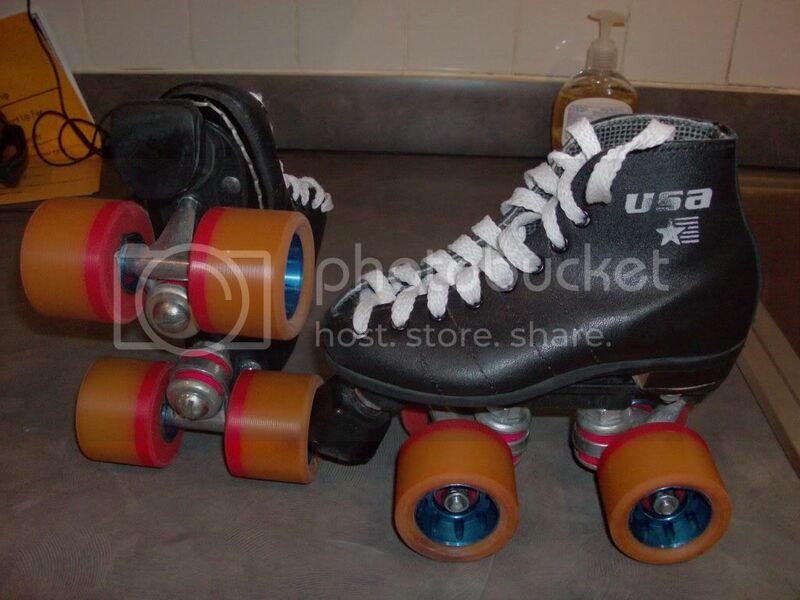 Once you hit a boot size 1M[ size 2 for W] the world opens up as far as packages, plates, and boots, but I would love to see what you parents have done for your younger kids in the juvinile 9J-13J size for Quad Speed Skates. Someone on here had mini O's a few years back and mini Lasers, and I also remember a Proline,395 on e-bay at size 1 AWESOME! Skates=NTS, German 2-Piece, Clips, 97A's,and a nice Soft Speed Boot. WOO HOO! GRAFIK IS GONNA SK8!!! My 4 year olds skates. J10 122s, mini Novi plates, Maniac wheels, Hartford bearings. He loves them even if they are white. Iggy 3/9/2011 "Name these wheels? Ok. I shall name the orange ones William and the blue and gold ones Benny." My 6yo has a set of Sure Grip Kangaroos (NTS single action plate) mounted to a Puma size J11 footy boot wiht the studs cut off. At the moment she is running my old worn down to about 50mm Zingers as they look like monster trucks with new 62 mm wheels on there. I will try to post a pic soon. Picked up some J11's used today in Fountain Valley. 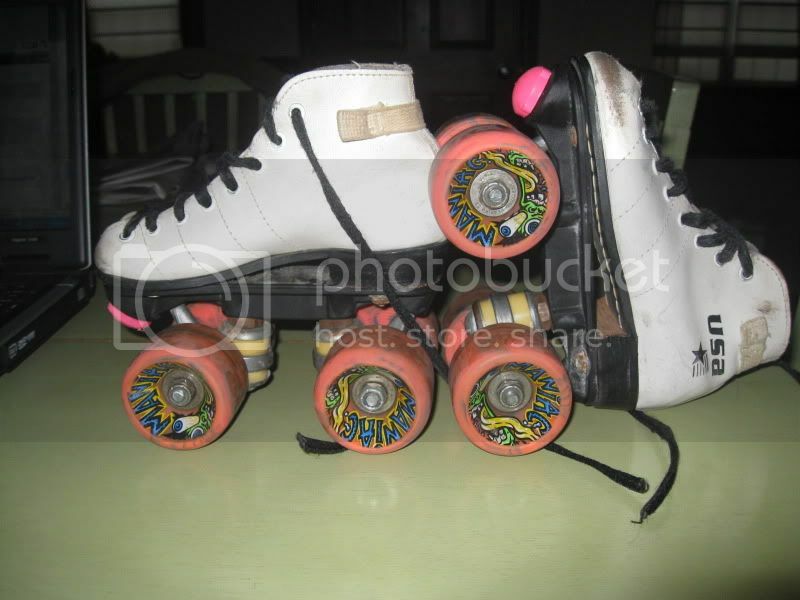 At adult night this Thursday I saw these slightly used J11's with upgraded wheels and bearings SOLD! 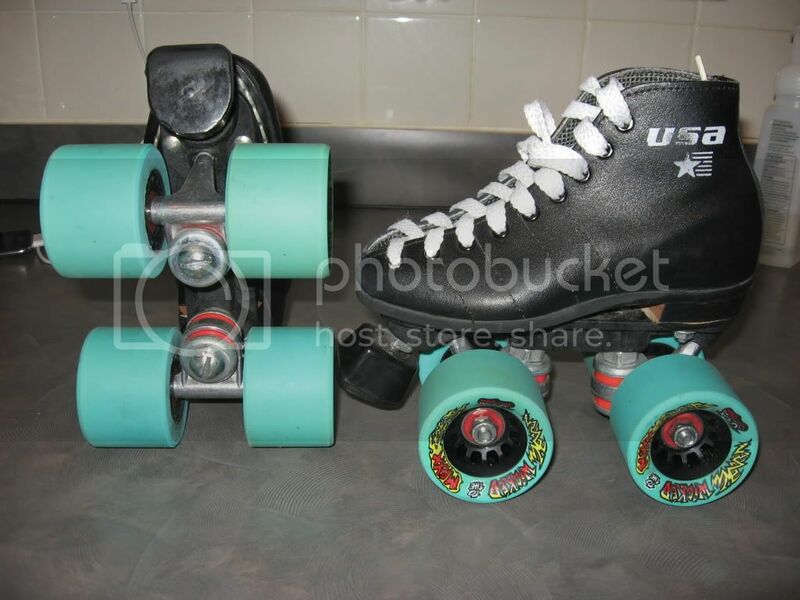 I just got the skates from susanmcp and the wheels from The Rebel (Jeff) and he loves them. They are a size 12J 122 with a mini Nova plate. He thinks he is the "Big Dog" at the rink now because he has monster tries like the adults. 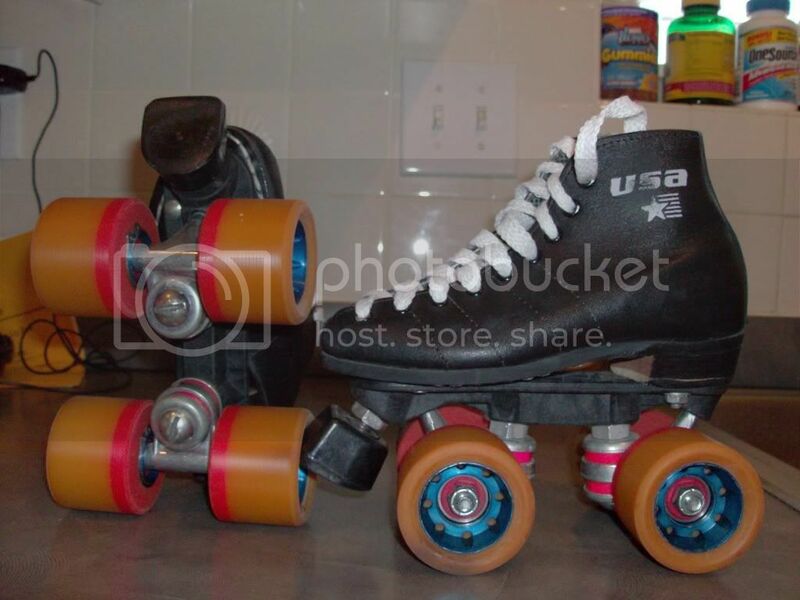 After thinking I decided to upgrade my sons skates a little so how about little FanJets skates now. My kid is still a wheel dragger, you are on dangerous ground with those! DayMan. Fighter of the NightMan. They are mini's and I have plenty. There is no price tag when it comes to seeing a big smile on their face. Reviving this thread.... There is very little info out there on junior skates. I stumbled upon this thread and found it interesting. Skates this small are tough. Hardly anyone makes them and a lot of them are gimmicks. Plates are always way too short and mounted aft. Wheels are an issue too because it's hard to find good narrow wheels for a tiny skater. I found a couple good sets of modern urethane on clearance and turned them down myself to 55 x 30mm wide. Soft blue Super Cushions, and the trucks have action believe it or not. Changed to regular rubber toe stop. The Pacer Charger boot seems comfy. Probably overthinking this, but the kids are into it and skating their asses off (and so am I ). The ones on the right are the birthday present for my youngest. Life is good. Last edited by mass_quads; January 23rd, 2017 at 05:09 PM. Some tips for parents who want their junior skaters to have the best possible skates when it comes to the impact of how their lower weight makes it more difficult for them to work the action. Working the action is primarily a matter of using the leverage developed by shifting ones focus of foot weight more to the left or right sides of the plate, and then shifting it back toward neutral. With junior skaters, the amount or weight that they can recruit for applying the leverage needed to effectively work the action is much lower than adults have. Consequently, there are plate design and setup factors to be considered which can potentially either aggravate or mitigate the child's ability the fully work the action through its full range of turning. 1) First and foremost, is that the cushions need to be only the softest/softer durometer, based on the weight of the child. 2) Next, is to make use of cone shaped cushions to reduce the turning resistance. For DA one or both of the cushions can be cones, depending on the child's weight. is rather slim compared to 30 years ago. 4) The Laser Slider plates are an example of a great plate option for junior skaters, and were specifically designed for small skaters. With their rear truck hangers able to slide forward along the plate to the point of wheels touching, a wheelbase short enough for even the smallest child could be set. Sliders are also SA and use the smaller 7/8" diameter cushions. Their tall deck height also gives smaller skaters a little more leverage for working the action. And being a very lightweight plastic plate makes it easier for the child to do faster foot movements. 5) Other mostly vintage light weight SA plates with 7/8" size cushions are Omega, Black Diamond, Satellite, and a few more. Laser plates in SA are still sold, but despite being plastic, they are rather heavy. 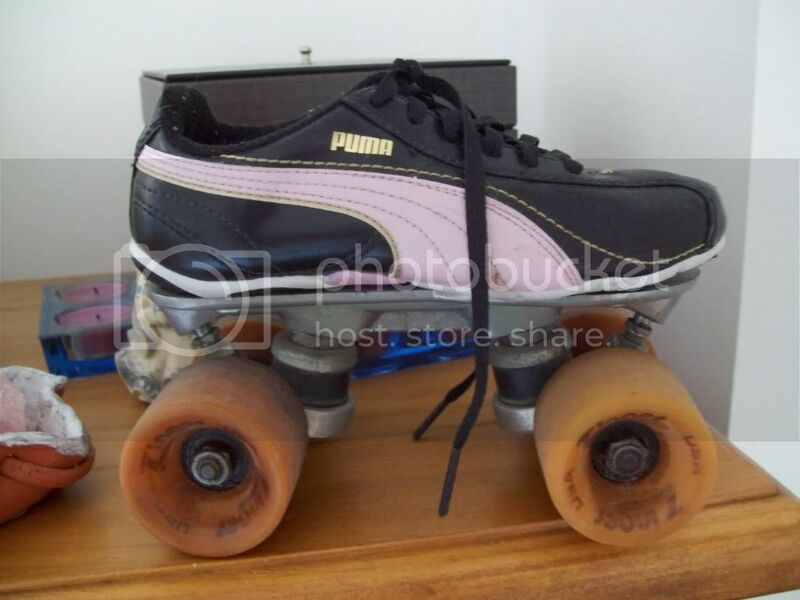 6) Smaller wheels under 60mm and of the softest available urethane will also be helpful for junior skaters, but if wheels are a lot narrower and action is too stiff, juniors will have trouble keeping four wheels sown when plate leans for turning. Any parent wanting to have the best possible skate setup for their child can PM contact me for further advice.